With the deadline for migration from analogue to digital broadcasting in Nigeria fast approaching, the claim of a stake by the British High Commissioner to Nigeria, Paul Arkwright, “to help Nigeria realize it’s digital switch over objectives” when he met Nigeria’s Information Minister, Lai Mohammed cannot be true.Until now, the British have shunned Nigeria’s 4 year attempt to commence the Digital Switch Over (DS0) which recently started off in Jos and subsequently continued in Abuja in December 2016. Sources close to the industry maintain that all the critical stakeholders in the DSO chain are fully owned by Nigerians and registered as Nigerian companies and that no British company has been tasked with any responsibility. The British High Commissioner, Friday held a “bilateral meeting” with the Minister of Information and Culture, Alhaji Lai Mohammed, where they agreed to explore areas of mutual interests including Britain’s desire to provide seamless technological expertise to Nigeria in for its Digital Switch Over (DSO) transition from analogue television signals to digital by June this year. Much as this will be greatly appreciated stakeholders wonder what this will translate to given that the process is on-going. 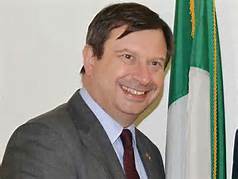 High Commissioner Paul Arkwright did not mince words in pushing for a British barge-in through its preferred private company : “We talked about the Digital Switch Over in Nigeria which is moving from a television analogue to digital. There is a British company, InView, that is working very hard in Nigeria and looking at ways in which British expertise can help in the very important switch over. Following very successful launches in Jos and Abuja, there are plans for other regions and other cities to benefit from that. And again this is an area of great cooperation which I am very proud to say the UK is at the forefront and the British company is leading the way on that,’’ Arkwright said. The High Commissioner’s remarks may have caused more than a murmur among stakeholders in the DSO particularly as they indicate that there is no British company called Inview in the process but a Nigerian company called Inview Nigeria. The involvement of Inview Nigeria has been suspect since their entry as sources close to the National Broadcasting Commission (NBC) maintain that disgraced erstwhile DG of NBC, Emeka Mba unilaterally and without the approval of NBC management appointed Inview Nigeria. It is also claimed that the involvement of Inview Nigeria has led to an astronomical increase in the cost of the transition for Nigeria and Nigerians. His Excellency may have now unmasked the Nigerian company to be a puppet of Inview UK. The Honourable Minister must be wary of this deceit. Inview Nigeria is said to be providing services to the NBC without any investment in the DSO process but has been allowed to cart away billions. Now flaunting diplomatic influence, InView Nigeria seems set to regain an unlicensed foothold in Nigeria’s DSO with eyes in upcoming towns and cities earmarked for switch over under the transition arrangement. The British High Commissioner got it totally wrong as no British company has any mandate in the DSO. The British delegation comprised the Deputy High Commissioner, Harriet Thompson, Political Counsellor, Ben Llewellyn-Jones and Second Secretary, Lyndon Hackney.